Get streaming beautifully with the AW-UN70 Professional PTZ camera. Take advantage of 4K resolution to give your audience all the details. Everything you need to take your live production to the next level is in here! The professional video industry's first integrated 4K PTZ camera, the AW-UN70 is your key to best-in-class pan/tilt/zoom 4K IP streaming and in-camera 4K recording. It delivers 3840 x 2160 resolution images at 29.97p/25p via HDMI, and is capable of doing it via IP streaming or in-camera. Featuring key production orientated features such as genlock, Optical Image Stabilization (O.I.S) and remote switchable ND filters. The AW-UN70 features a next-generation 1/2.3-type MOS sensor and DSP (Digital Signal Processor) for high sensitivity and high resolution up to UHD/30p. With the four-drive lens system, three zoom lenses and one focus lens are driven independently and simultaneously achieving a smaller body and a zoom mechanism with high magnification and high image quality. The AW-UN70W/K has a high-resolution 20x optical zoom and a high-performance iA 22x zoom (4K mode). Built-in optical image stabilization excels in vibration caused by wind, subwoofers/loudspeakers, ventilation systems, and more. The AW-UN70 is quite a step up from the AW-HE40 introducing broadcast/production oriented feature-sets including a motorized ND filter wheel for varied lighting environments, 3G SDI for up to 1080/59.94p output, external sync input (genlock), and more. Even for HD usage, a higher image quality is achieved with a higher quality lens system which has better focus tracking and evenness throughout the image. The pan range of ±175° and the tilt range of -30° to +90° cover a wide shooting area. Pan and tilt operate at a maximum speed of 90°/second and respond quickly to remote control operation. They operate quietly at a sound level of NC35 or lower. Up to 100 preset positions and camera settings are stored in the camera, more than enough for the most demanding large venue installation. The camera weighs only 3.3 lbs. and consumes just over 15.6 watts at 12 VDC. 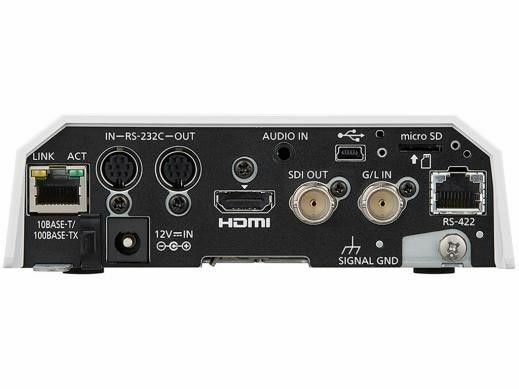 Video Outputs: Standard professional interfaces include HD/SD-SDI, HDMI, as well as IP/Network for single cable delivery of high-quality content up to 1080/60p. USB or microSD Card Recording: The mini-USB connector allows the AW-UN70 to be utilized as a USB camera utilizing standard USB Video/Audio class drivers. Many applications that connect to USB cameras, such as teleconferencing or software switching solutions, will be able to connect to the UN70 without external converters. Alternatively, microSD recording enables ISO MP4/H.264 recording internally in the UN70, transfer of content over the network via web browser or FTP. Harness the power of NDI® with Panasonic's lineup of professional PTZ cameras. Our N-Series model cameras now have built-in support of NDI® via a highly efficient NDI®|HX mode, requiring no external conversion of any kind. Single cable: All the functionality of conventional connections is now practical through the use of PoE+. Not only is set-up simplified, but via a single cable, you'll get power, control, ultra-low latency video, and tally. And, thanks to NDI®, automatic camera discovery makes it all come together. Redundancy: Production workflows are mission critical. Introduce redundancy to your workflow by utilizing NDI®|HX and baseband video (HDMI and/or HD-SDI) simultaneously. Multicast: Panasonic cameras with NDI®|HX support multicast, meaning you don’t utilize extra bandwidth when multiple clients access the stream. Audio Input: The UN70 features a TRS-mini stereo audio input for embedding audio into the NDI® feed.